Dogs brought laughter and plenty of awes as they showed off their skills in the 22nd annual North Dakota State Pre-Vet Dog Show, Jurassic Bark, to raise money for the student organization. On April 14 in Shepperd Arena, 22 students from the Pre-Vet Club took part in the production of Jurassic Bark, as the chair of the show, Skylar Buckingham, made sure everything was running smoothly. Baba won first place in beginners agility through his clear jumps. The Pre-Vet Club has meetings to educate and help students on their way to success in the veterinary field. They visit veterinary medicine schools, have veterinarians and previous pre-veterinary medicine students speak, tour facilities around the Fargo-Moorhead area and are informed of any volunteer or job experience openings. There were sections of obedience, tricks, agility, jumps and costumes where people and dogs of all ages entered in hopes of winning prizes at the end. Throughout the competition, the audience enjoyed seeing the different personalities of the dogs, leaving the show with a light-hearted feeling. Fan favorite, Bundles, awed the crowd through his excitement of being a dinosaur. 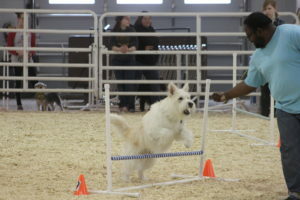 Bundles was a favorite of Pre-Vet Vice President Buckingham because of his up show in the agility portion of the competition. As his owner tried to make him jump, Bundles had other plans, running about the arena in excitement of all the eyes watching him. 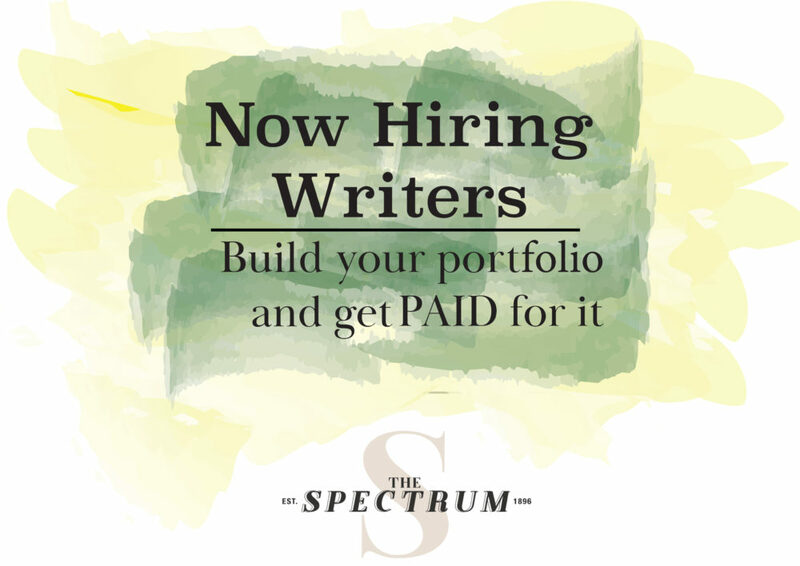 “I love beginner’s agility when they really struggle and then they figure out the first jump and then they’re just crazy,” Buckingham shared. Audience members were shocked by the tiniest dog in the competition, Beatrice, who made sure to impress by showing how high she could jump throughout the courses. Many dogs got stumped by the tunnel that they had to run through. Abby, Baba and Callie all got too excited and kept turning around inside the tunnel, leaving their owner to wonder where they went. However, the crowd roared in excitement once they exited the right side of the tunnel. For the tricks competition, Shadow left the audience in awe by his height as he stood on his hind legs, waiting for his treat. 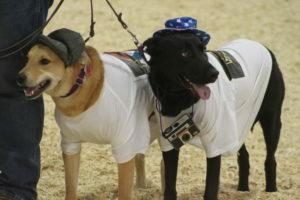 Xavier and Storm won costumes by dressing up as tourists in Jurassic Bark. 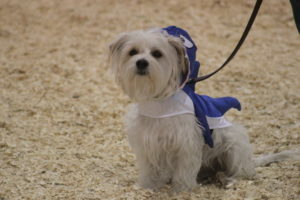 With the final portion focused on costumes, dogs wowed the audience with their themed costumes of Jurassic Bark. Xavier and Storm won the audience over by their “tourist” costumes, which included fanny packs, hats and a camera around their neck. Another favorite was Coda’s Stegosaurus costume, and the duo of Beatrice, as a dinosaur, and Raven, the Jurassic Bark ranger. Jurassic Bark not only brought dogs together, but it brought people together for a fun competition. 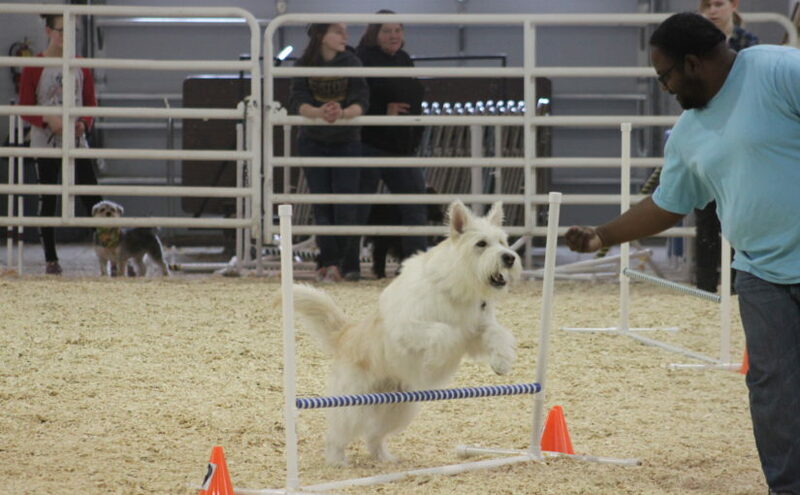 Overall, the dog show helped the NDSU student organization. Kramer explained that other than the information and networking they receive, it is also a place where future veterinarians can find people like them, leaving them feeling less alone.